TM 9-243 REPLACING THE HANDLE - Continued REMOVING OLD HAMMER HANDLE 1 If the handle is split or broken, remove it from the head. 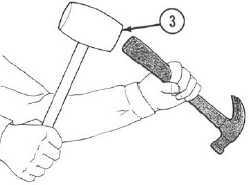 2 If the handle is too tight to pull loose from the head, proceed as follows: Place hammer in vise. Saw off handle (1) close to head (2). Drive the remaining handle out through the large end of the head (3) using drift pin. 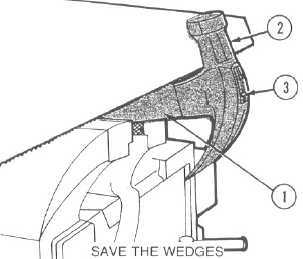 Save the wedges. INSTALLATION OF NEW HANDLE WARNING WEAR EYE PROTECTION AND WATCH THE FINGERS. NEW HANDLE WOODEN WEDGE METAL WEDGE 2 Insert handle (1) in head (2). 1 Obtain new handle and wedges. 21-14 3 Seat handle in head with a rubber mallet (3).